This is a leaked email from climate denialist Fred Singer to bloggers, scientists, peers, and public relations experts regarding the release of the documentary “Merchants of Doubt,” which profiles Singer (along with many of the people to whom he sent this email) as part of the network of climate change denial and legislative delay on action in the United States. The movie came from a book of the same title by historians Erik Conway and Naomi Oreskes, and exposes the history of corporations using public relations to create doubt and skepticism around science – the technique has been used by the tobacco industry, and now by the fossil fuel industry. 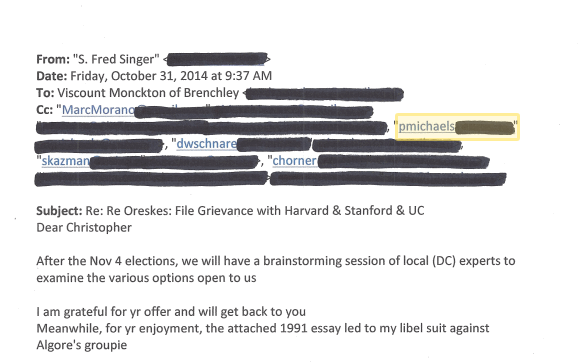 Many of the people to whom Singer sent the email have long-standing financial ties to the tobacco and oil industries, including Patrick Michaels. Michaels is an established climate denialist who continues to be cited as an expert on climate issues despite his extensive ties to fossil fuel interests and repeatedly inaccurate claims on climate topics.